Well, it actually was rocket science. While researching about the next 41 for Freedom boat in the series (USS Ethan Allen), I stumbled across this report on guided missiles that was printed by the US Government. It is an unclassified document but included all of the various types of guided missiles that were in use in 1963. There was a brief mention about a future development called SUBROC but the idea was still on the drawing board and it had not yet been deployed. Since the focus this year is on Polaris and the 41 for Freedom, I thought it would be interesting to include this section in the way of detailing a little more about the weapons systems we had back in the day. As always, I am amazed that the system worked as well as it did. When you consider how many contractors and subcontractors were used to produce the hundreds of thousands of pieces and assemblies required to make it all happen, it is phenomenal that it was so successful. In January 1963, the Armed Forces of the United States included more than forty guided missiles in their military plans and budgets. Some of these missiles had become operational, that is, they had passed acceptance tests and had become available to carry out their missions. Other were in the production stage. Some were in earlier stages, that is, development or test. Facts about guided missiles were sought by people who worked with them, people who wished to design or manufacture them, as well as people interested primarily in learning about this new threshold in military technology. Much had been written about guided missiles, both truth and conjecture. The Department of Defense had issued many press releases about them. In spite of these sources of information, questions about guided missiles continued to come to the Office of the Director of Defense Research and Engineering. This booklet was compiled in response to these questions. Data from Department of Defense press releases and photographs of our United States Guided Missiles have been incorporated into this presentation. The form is intended to aid the reader to find easily the features of each guided missile, such as type, physical characteristics, missions, developing agencies, and status. The guided missiles included here have, for the most part, been developed under the technical direction of the Military Departments in government laboratories and in commercial or not-for-profit organizations. Each Military Department has the responsibility for development, test, production, and procurement of the missiles in which it has primary interest. A few of the missiles have been developed under the Mutual Weapons Development Program, and a few have been purchased from their producers in other countries. Ballistic missiles can be guided through the initial part of their flight. They include intercontinental ballistic missiles (ICBMs), intermediate range ballistic missiles (IRBMs), fleet ballistic missiles (FBMs), and battlefield ballistic missiles. A few readers may be disappointed by the omission of several weapons that have been treated as guided missiles in some publications. Among these are the Air Force’s GENIE, the Army’s HONEST JOHN and LITTLE JOHN, and the Navy’s Weapon ALFA, HVAR, ZUNI, and ASROC. These weapons are not true guided missiles; they are rockets. A rocket, like a guided missile, carries within itself the energy required for its operation; however, unlike a guided missile, a rocket traverses a trajectory that is determined at the instant of launch and cannot be altered after launch. Other readers will doubtless miss details of the many uses of missiles as boosters for space vehicles, such as ATLAS-AGENA, THOR-ABLE and JUPITER C, as well as mention of boosters in development, such as TITAN III. Initially, the space program derived its boosters from the guided missiles program. 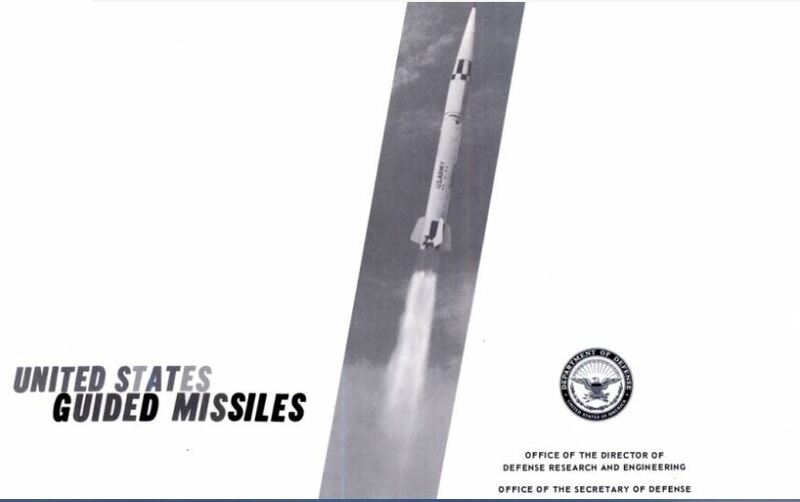 However, the space program is now separately identified, and descriptions of these early, missile-derived boosters are not properly a part of a booklet on United States guided missiles. The illustrations were furnished by the Military Departments from their official files. Administrative, editorial, and fiscal assistance in the compilation and preparation of the manuscript was provided by the Missile Development Office of the Research, Development, Test, and Evaluation Group ( RDT & E ) of the Bureau of Naval Weapons. The booklet was designed by the Illustrations Project, Technical Reports Group, Applied Physics Laboratory, and The Johns Hopkins University. REGULUS I, resembling a swept-wing jet fighter aircraft, was the first attack missile to join the Fleet. Its development began in 1948, and the missile system became operational in 1954. 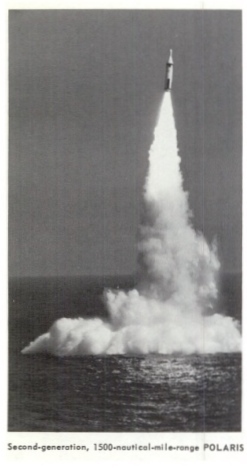 The last REGULUS I missile was produced in 1958. Among the ships currently in commission that have a REGULUS I capability are submarines and cruisers. The prime contractor for REGULUS I was Chance-Vought Aircraft, Inc., now a part of Ling-Temco-Vought. POLARIS, a deterrent/retaliatory missile, was designed primarily to be launched from submarines (SSBNs). It may be fired while the submarine is either surfaced or submerged. The fleet ballistic missile weapon system includes not only the missile itself, but also nuclear- powered missile-launching submarines, support facilities and specially trained personnel. Each SSBN can carry 16 POLARIS missiles and launch them in as many minutes. POLARIS is basically a projectile traveling a ballistic path through space. The missile is lifted to altitude and set on course by its propulsion and guidance components. After the propulsion system cuts off, the missile is governed by natural forces, such as gravity, on its way to the target. In contrast to the earlier tradition of naming submarines after fish, fleet ballistic missile (FBM) submarines are being named after American statesman, patriots, and heroes. The first SSBN to become operational, USS GEORGE WASHINGTON, was deployed in November 1960, after completing a series of underwater launches that began with the historic underwater launching of two POLARIS missiles on July 20, 1960. 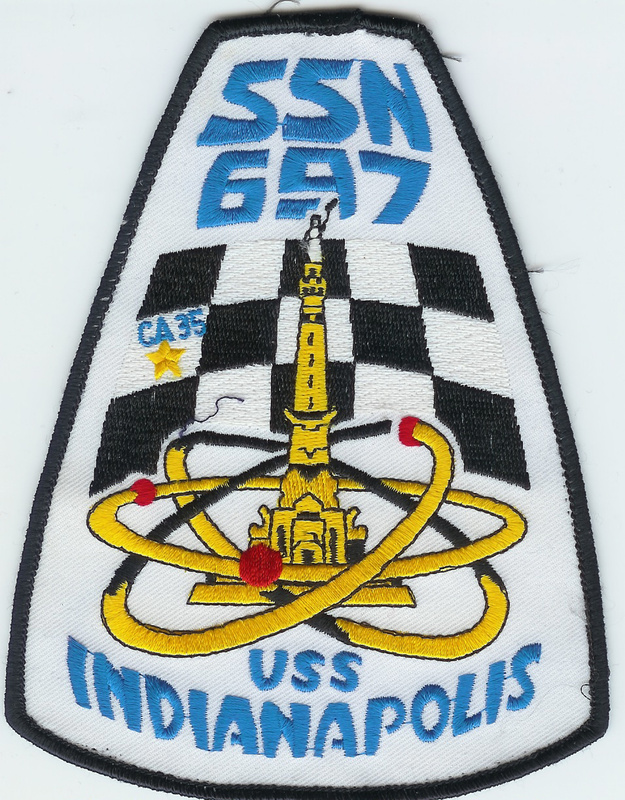 The GEORGE WASHINGTON class of fleet ballistic missile submarines includes USS PATRICK HENRY, as well as USS ROBERT E. LEE, USS THEODORE ROOSEVELT, AND USS ABRAHAM LINCOLN. USS ETHAN ALLEN, the first ship in its class, was launched in November 1960. It is 30 feet longer than the GEORGE WASHINGTON class ships, displaces 1000 more tons, and was designed to carry 1500-nautical-mile POLARIS A-2 missiles and 2500-mile A-3*s. Other SSBNs in this class are USS SAM HOUSTON, THOMAS EDISON, JOHN MARSHALL AND THOMAS JEFFERSON. USSETHANALLEN was the first submarine to launch a POLARIS A-2 missile. USS LAFAYETTE, the lead ship of another class of fleet ballistic missile submarines, was launched in May 1962. It was sponsored by Mrs. John F. Kennedy. 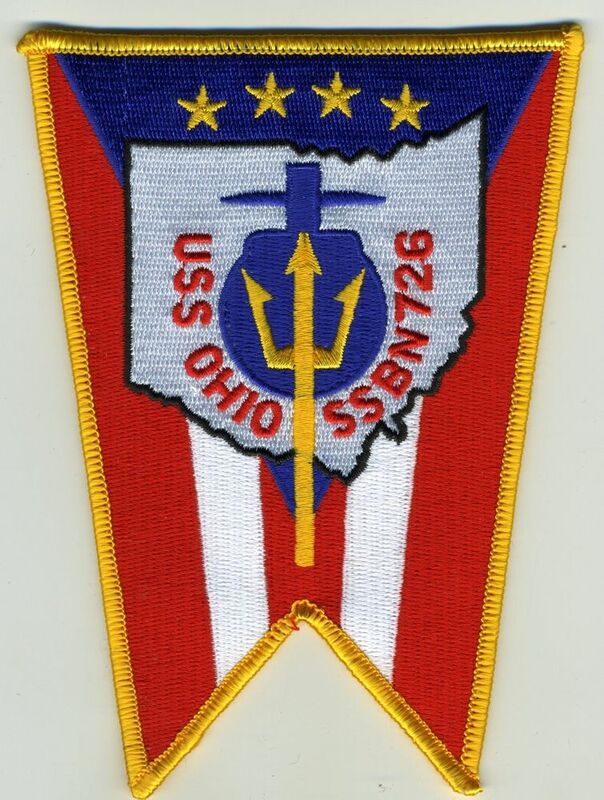 Three additional submarines of this class were named in June, after Ulysses, S. Grant, Stonewall Jackson, and Nathanael Greene. On January 8, 1963, the Navy had nine SSBNs deployed, one in commission but not deployed, seven launched but not commissioned, and 18 more building or authorized but not yet launched. The fleet ballistic missile weapon system is now a part of the Atlantic Command. Support facilities are located at Portsmouth, New Hampshire; New London, Connecticut; and Charleston, South Carolina. The locations for similar facilities have been selected in the Pacific area at Bremerton and Bangor, Washington, Pearl Harbor, Hawaii; and Guam. 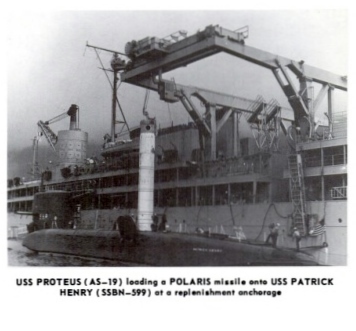 The first FBM submarine tender is USS PROTEUS, which was modified to serve in that capacity and is now anchored at Holy Loch, Scotland. The tender provides supplies, service, and all but major repairs to FBM submarines. This service includes furnishing missiles and loading them into submarines. 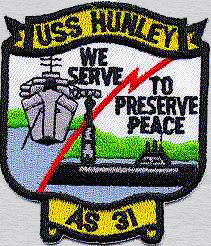 A second tender, USS HUNLEY, has been launched. A variable-depth launch facility for testing POLARIS missiles, the first of its kind, is in operation at the U.S. Naval Ordnance Test Station’s San Clemente Island Test Range. The 2500-nautical-mile POLARIS A-3 missiles, now in the development stage, will be tested at this facility, as well as at Cape Canaveral and other facilities. President John F. Kennedy and Prime Minister Harold Macmillan discussed the possibility of provision of the POLARIS missile to the United Kingdom by the United States when the two men met in Nassau, Bahamas, on December 18 to 21, 1962. The President and the Prime Minister agreed that the United States will make available on a continuing basis POLARIS missiles (less warheads) for British submarines. Implementing agreements are pending. Development of the POLARIS FBM system is directed by the United States Navy Special Projects Office. Some 11,000 contractors and agencies have cooperated in the work of this project and have produced some 250,000 different assemblies and subassemblies.